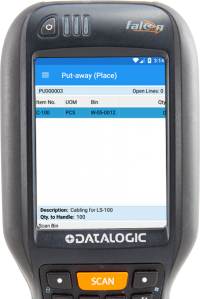 The Warehouse Insight picking screen displays the entire pick on the handheld device, and immediately alerts the user if an improper bin or bar code is scanned. 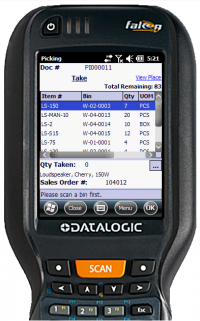 As each item is scanned, the description, lot number, and serial number are displayed to verify that the items are properly labeled. Warehouse receipts and put-aways can be automatically created for an item or PO by scanning or entering the item number and/or purchase order number. Inventory picks and put-aways fully support non-Directed Pick locations, including those without Bins Mandatory. The system eliminates redundant data entry by capturing all item tracking information at the pick stage and updating the source document line.